Samsung Family Hub Refrigerator: Samsung launched a refrigerator, which is also a home entertainment system and a 21-inch TV. The intelligent refrigerator comes with three small high-quality cameras which capture the image every time the doors opens or closes and makes the data available via a related application. Adding another dimension to the word of smart devices, Samsung has officially announced his new refrigerator, which comes with a large touchscreen 21.5-inch LCD that you can surf the Internet, shop and see a movie. Unveiled for the first time at the European Forum of Monaco, the Samsung family hub refrigerator comes with a vertical touch screen LCD TV that can be used as the digital control unit, allowing users to perform multiple tasks that include sharing our family calendar, to see photo, determining what is inside the refrigerator while shopping from the grocery store or even watching a movie while cooking. 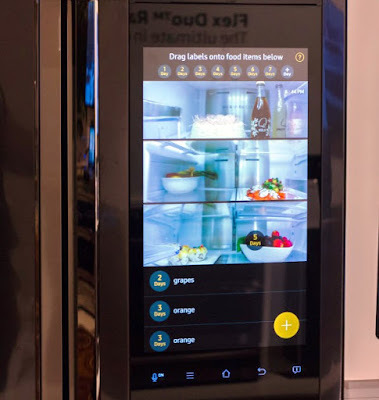 The intelligent refrigerator comes with three small high-quality cameras within the device so that the doors close detected each time and makes the data available via a related application. It also shows the product expiry date placed in the refrigerator while Refrigerator Manager controls the freezing temperature and check the status of the water filter. You can also check outside weather, surfing social media sites, with speakers in the design, listen to music and much more. The intelligent refrigerator all inclusive is at a whopping price of $5,999.99 for a counter depth size and $5,799.99 for its full size in the US.